Held for three days from 1st to 3rd November 2018 in Bank Muscat’s Headquarter, the Sas48H contest, organized by the Information Technology Authority (ITA(, represented by Sas Center for Entrepreneurship and in cooperation and support of Bank Muscat, was concluded last Saturday evening witnessing the participation of 120 participants distributed into 19 teams working on different and creative ideas in mobile app and web development field during 48 hours only. The closing ceremony was under the patronage of HE Eng. Ahmed Bin Hassan Aldheeb, Undersecretary of ministry of Commerce and Industry and Deputy Chairman of ITA’s Board of Directors and with the presence of Dr. Salim Bin Sultan Al Ruzaiqi, CEO of ITA, Waleed Alhashar, Deputy CEO of Bank Muscat and a number of ITA’s and Bank Muscat management. After the demo show of developed projects, the jury committee shared its final results and winners were announced and honored. the first prize worth of OMR3000, went to Zafafee app, which is a market place offering services for wedding celebrations such as nearest beauty Centers, hinna makers, dresses designers and food catering. The second prize, worth of OMR2000, went to Tawleefah app, which is a platform gathering various service providers for daily requirements so that consumers can reach them easily. The third prize worth of OMR1000, was taken by "bitter Twitter" app which offers details information and analysis about the reputation of organizations either government or private and its projects based on users reviews and comments on social media channels. In addition, some projects have been selected by the jury committee and awarded special prizes among which the family team which participated at the contest and developed “Besecure” app which provides security and privacy services using artificial intelligence. “Bitter Twitter” was selected for the excellence in technical development during the contest, "Quick parking", which is a mobile app that enables users to pre-book a parking in the crowded cities and shopping malls. “Oman Encyclopedia” a simplified mobile encyclopedia which enables users to read, search and share information about Oman. "Bonet" app facilitates the communication between deaf people and the community through translating sign language into text or audio or vise versa. “we will spare no effort, at Sas Center for Entrepreneurship and other specialized centers, in incubating and supporting these talents in this dynamic and vital field,” he added. In this addition, 370 candidates registered to join the contest, 120 of which have been selected and moved to the next phase. Out of the 120 participants, 60 developers, 25 designers, 35 project managers and marketers distributed among 19 teams participated to work on the implementation of 19 ideas. 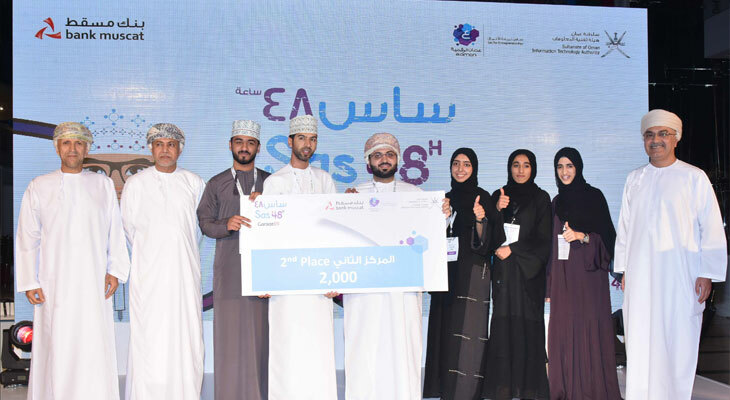 The contest aimed at promoting entrepreneurship through encouraging young Omanis to turn their innovative ideas into reality and establishing emerging Omani companies in the ICT field, website and mobile applications development in particular. It is worth mentioning that the winning teams received cash prices reached up to OMR6000, and part of it will be allocated to courses and consultancies for the teams to develop their projects. In addition, the winners may have the opportunity to join the Sas Center for Entrepreneurship at ITA, which seeks to incubate and establish Omani emerging companies in ICT sector. These incubated companies will be provided with a range of services and facilities, including an equipped office in the knowledge Oasis – Muscat, technical consultancies, as well as monitoring, training, accounting, financial, marketing and legal services, government support and financial assistance.